I recently had the chance to sit down and play a preview build of Hudson’s latest Wii game collection, which has been appropriately titled “Deca Sports”. My first impressions of this game are quite good, despite my previous low expectations of “Just another minigame collection” for the Nintendo Wii. In the preview build of the game, 4 games are available. The 4 games are Badminton, Super Cross, Beach Volleyball and Figure Skating. No single player challenges of any sort are available in this preview build, but both 1-player and multiplayer quickmatch games are playable as they will be in the final version of the title. The games are all quite fun and the collection will only get better when all 10 games are available, along with their single player challenges in the retail version. The first thing I noticed about the game was the awesome soundtrack. If you’re a fan of the Europop genre, the music will do a wonderful job of getting you pumped up for whatever sports event you may feel like partaking in. From the Eiffel 65 music pumping through the speakers on the title screen to the various tracks throughout the game, I found myself bobbing my head from time to time. The sound effects, on the other hand, are a bit generic, although not even close to terrible. Thankfully, the sound effects mean nearly nothing in this style of game so long as they aren’t painful to listen to. On the cosmetic side of things, this game looks almost identical to Wii Sports, although not as polished at points. There are quite a lot of obvious rough edges and jaggies, but the game is fun enough to compensate for the lack of graphical quality. One thing that really disappointed me, however, is the lack of Mii enhancements. There are 8 pre-set teams with absolutely no ability to use your own personal Mii in any way. I was hoping that this game would incorporate more use for the whole Mii gimmick, but it seems like that stuff is slowly falling off the radar. The controls are pretty good, a side from Badminton, which is annoyingly unresponsive. I tried swapping Wiimotes and various batteries, but after all of the time invested into the control tests, I was still sorely disappointed. 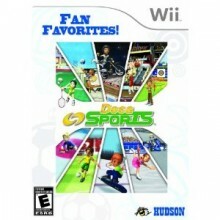 Thankfully most people have their “Wii Sports” discs and can simply play the tennis game there, which is far superior to the Badminton game in “Deca Sports”, so the poor controls of Badminton is not a huge loss. Super Cross uses a sort of “tilt control scheme” as opposed to the normal “steering wheel” scheme of previous Wii racing titles. The player holds the Wiimote sideways, as if it were an NES controller. To turn left or right, you simply tilt the Wiimote in the proper direction. If you’re in the air, simply tilt the Wiimote either towards your body or away from your body to stabilize your character. The “2” button accelerates and the “1” button + the d-pad are the breaks. It works out very nicely and makes for a rather fluid Super Cross racing experience. Beach Volleyball controls almost exactly like you would expect. You hold the Wiimote straight up, swing it back/up to block spikes/initiate serves and swing down to hit the ball. If you swing down at the appropriate time, you’ll spike the ball. It’s really that simple and after a few rounds of practice, anyone should find this to be enjoyable for the entire family. The final of the 4 games included in the preview build, “Figure Skating”, is the only one that uses the nunchuck in this build of the game. Players control the character’s movement with the nunchuck and simply flick the Wiimote up when the character is skating over an “element”. While controlling the character, you must collect all of the yellow circles and perform all of the tricks by flicking the Wiimote up when the character is in the center of the various colored circles, such as the blue circles. If you perform all of the tricks and skate along all of the yellow circles without fumbling at all, you’ll get a perfect score. It’s a simple concept, but works well and is actually quite fun. After extensively playing these 4 games, I’ve concluded that “Deca Sports” is shaping up to be a really good collection of games that may just be the next best thing since “Wii Sports”. Hudson is doing a great job. Look for “Deca Sports” at your local retailer sometime next month.